With young children at home, you face a two-fold dilemma. First, how do you grow in the Word during such a busy — and often exhausting — season? Second, how do you inspire and train your children to grow in the Word? Today we’re chatting about some simple, intentional tips for studying the bible with children at home. Do you have young children at home? Or maybe you remember what it was like? I know I do! While children are indeed a blessing, and being a mom is my favorite “job” in the whole world, some days were downright TIRING in those early years and I felt like I couldn’t get anything done. Picture this: The kids have pulled every toy out of the playroom, crumbs are on permanent display in your carpet, and sticky handprints on the walls have eliminated all need for artwork. With young children at home, you face a two-fold dilemma when it comes to walking with Jesus. First, how do you grow in the Word during such a busy — and often exhausting — season? And second, how do you inspire and train your children to grow in the Word? While this may not be the season for lots of in-depth study, you can still create a habit of being in the Word, model it for your children, and teach them to have time with Jesus, too. 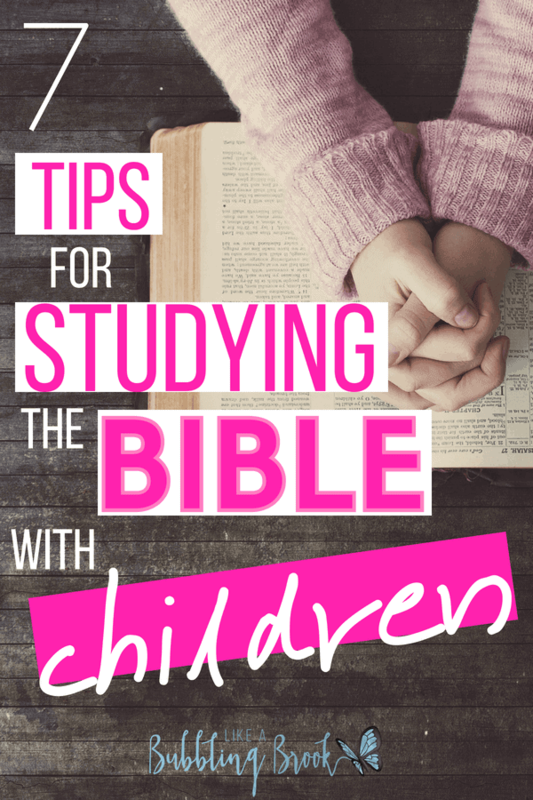 Looking for some simple, intentional tips for studying the bible with children at home? Here are a few ideas. Study the bible as a family. Whether it’s having family bible time in the evenings, doing family devotionals, or all participating in a “pretend” church service at home, this is a fun way to grow in the Word together. Let the little ones sing a song or play one of their toy instruments. Say a short prayer together. Let mom, dad, or an older child share a bible passage and their thoughts on it. Talk about how you can apply it to your life, and how even the youngest child can apply it to their life. Read story bibles with them. Find a set time each day to read a portion of a story bible. When our kids were younger, The Jesus StoryBook Bible was well-loved. As they’ve grown, the Action Bible (with comic book style illustrations) was a big hit with our boys. Find what works for your family and enjoy it together! Depending on the age and ability of your child/ren, you may keep this as simple as “Jesus wept” (John 11:35). One of the first verses we taught our children was Acts 2:38, because it encapsulates the plan of salvation. Once they’ve mastered a verse, add another. Let them see you read your bible. There are audio versions of the bible available on CD. Play it while you’re doing housework or picking up the playroom. You’ll be amazed at how much they’ll absorb! Not sure what’s good? This audio bible gets rave reviews. Work through an engaging bible study together. Use a book of the bible that many people enjoy reading, and kids can begin to understand, like Psalms or Proverbs. Talk about what you read together. 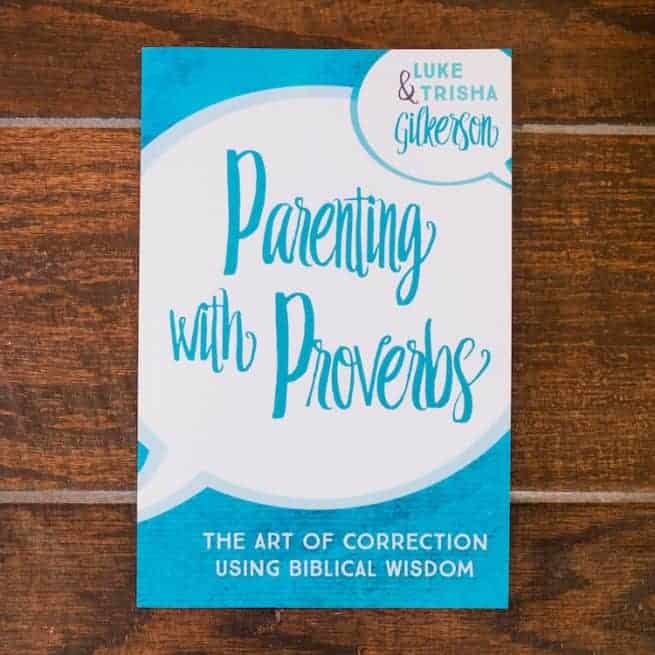 One great resource to look into is Luke and Trisha Gilkerson’s study called Parenting With Proverbs. You’ll find biblical wisdom for parenting at all stages, and it also includes 14 short studies to discuss with your children during/after your reading. The digital version also includes scripture cards! Practice observing and writing out scripture with them. 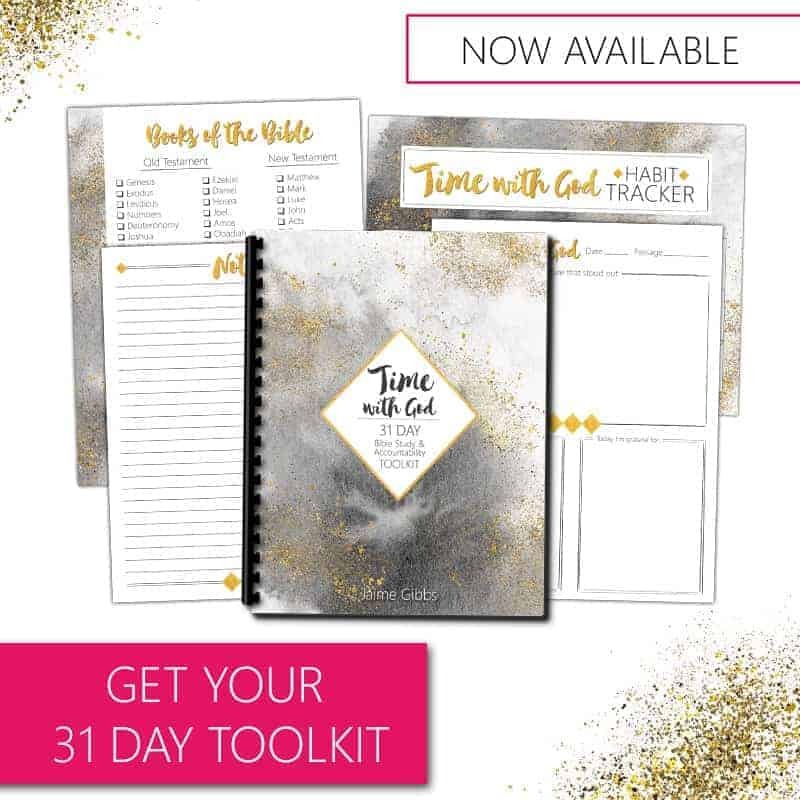 You can use a simple spiral notebook, or download my Time With God Accountability Toolkit. Write that day’s passage, what stood out to you, ideas for applying it to your life, and more. Each of you can keep a separate toolkit and write your own thoughts, but discuss and share ideas together. If your child isn’t keen on writing, they can draw pictures instead. Cross off each day when you’re done. Above all else, remember to ask the Lord to help you in this endeavor. What you desire to do is right and glorifying to God and, if you ask, He will guide you as you pass this legacy to your children. Pray for the Holy Ghost to be evident in your life, and pray that your children would grow deeps roots in the Word as you cultivate a godly home and a rich atmosphere for making Him known! May they grow in sensitivity to His Spirit, with a love for truth, and may it continue to multiply throughout their lifetime! What are your tips for studying the bible with children? We’d love to know! Thank you for these tips. I am going to look into the audio Bible. As a Prodigal returned, I have the additional challenge of an unbelieving husband – Papa to my girls. I think your tip to ask the Lord is the most important. He has provided in beautiful and unexpected ways for us. We read their children’s story Bible every night with their Papa present- truly a miracle. I have seen the Word not return void, not just in the girl’s life. God truly is the Head of our home and also speaks to us through my husband. The more I have trusted Him at His Word – that my husband and children are sanctified through the faith He has given me – the more I have seen Him at work in our midst. Just today, He answered my prayer for another way to expose my eldest to the Word – I long for her to truly ingest verses of the Bible and become more confident in God’s love for her, particularly as she faces heartache for standing up for what is right. I found a beautiful devotional in her mother tongue. And I also discovered the joy of doing a Lectio Divina with her – where we listened to Scripture being read aloud several times and listened for the Lord’s Word to us. He spoke in such an intimate way to her and she was so encouraged. Such great tips that I try and do but so good to be reminded. I will look up that Scripture Memory from Acts that you mentioned. We’ve been working on one Scripture a month with my Miss 5 regarding the power of the tongue and I’ve been meditating on it also and writing a blog post about it with a video of us doing actions to help us remember it. Sometimes I listen to a Bible podcast, but I think the most important thing, as I was saying on Instagram is n0t whether you eat oatmeal for Breakfast everyday, but that you eat Breakfast, and the same with the Bible, it’s not the format, but the ingesting of the Word that makes the difference.